Is a Size 6 Petitie but will fit a small size 8. TOPSHOP SHIRT DRESS SIZE UK 14. Condition is perfect as only worn once. Photo dies not do it justice. It is a lovely pale yellow colour. Dispatched with Royal Mail 2nd Class. L ov el y li tt le d re ss b y. N ew without ta gs. 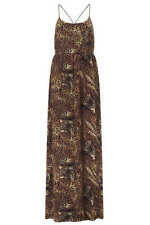 IT'S MADE FROM A LOVELY QUALITY SOFT MATERIAL IN A VERY ELEGANT STYLE ♥. Topshop Bodycon Dress, size 10, Black And White Check! 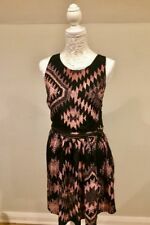 Excellent condition, Black & white checked short sleeved dress with black panels down both sides! Other details on pics Thank you! SIZE 10 BNWT Topshop SOLD OUT Austin Floral Print Angel Sleeve Midi Dress Blush. Condition is New with tags. Dispatched with Royal Mail 1st Class. Create an angelic look with this angel sleeve midaxi dress in an all over daisy print. We love the spring summer-ready splash of playful colour, creating a floaty and feminine look. Detailed with a front split, this piece is the latest 'it' ensemble to add to your collection. 100% Polyester. Machine wash.
Two splits up the front . Beautiful cute summer dress from Topshop. Never worn. Crepe feel polyester. The waist doesn’t have a lot of give so it can fit a large 12 or a small 14. Grey dress with two wide black stripes on each arm. Ribbed around neckline, cuffs and hem. Condition is Used. Slight bobbling reflected in price. Topshop Casual Dress, Size 10, Black, BNWT, RRP £29. Condition is New with tags. Dispatched with Royal Mail 2nd Class signed for. Lovely dress, but sadly never worn so decided to sell. Bought last summer. Can be worn on or off the shoulder. From a smoke and pet free home. Blue Topshop cowl neck dress in UK size 8. Brand new with tags, never worn. Featuring a fitted waist and flippy skirt for a flattering silhouette. 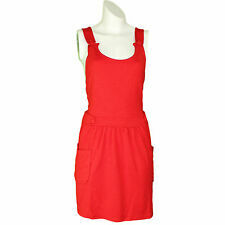 TOPSHOP Dress - size 12. Condition is Used. Dispatched with Royal Mail 1st Class. TOPSHOP - Austin Floral Print Angel Sleeve Midi Dress - UK 12. Condition is New with tags. Dispatched with Royal Mail 1st Class. Womens electric blue Skater Dress from Topshop. Size 12. Nice and stretchy. Looks great worn with leggings and trainers. Condition is good/ Used. Any questions please feel free to contact me. With the trend for ruching and pleating sticking around in 2019 this dress is up to date and with the military green it is perfect! Minimal signs of wear and zip in good working order. Length - 89cm (35in). Colour: Mint Green Playsuit. Size: UK 10. FRINGED DETAIL ALONG THE WHITE FRILL. Rodeo print frill western mini dress with fringing detail. 100% Polyester. Machine wash. BLACK SATIN LOOK FLORAL PRINT. MINI LENGTH. SIZE 10 UK. FRILLED HEMLINE. Topshop Ditsy Floral Wrap Dress Size 12 Very Good Condition. Condition is Used. Lovely little vintage looking mini dress than no longer fits in really good condition and perfect for the spring/summer months ahead. It had wrap over details and slightly frilled sleeves for a feminine touch. 97% Polyester, 3% Elastane. Machine washable Thank you for looking! Dress will be sent via Royal Mail 1st Class Signed for. Topshop Black and Pink Ditsy Floral Daisy Print Dress. Size 8 Wrap top with frills. Tie at waist with floaty skirt. Perfect for summer Great condition. Lovely orange maxi dress from Topshop. T-back and lovely silky feel. Bought new off Ebay for holidays but never worn and selling cause I just don't think it will ever suit me.